Not your traditional pony ride—you’re off to the races! You’ve got open range and can turn your pony into a wild and untamed animal as you bounce around the party having a ball. Build some structure around this activity by setting up an obstacle course or straightaway lanes that can be used for races. These ponies are sure to delight kids (and adults) of all ages. 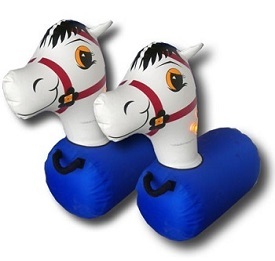 These are great fun for birthday parties, picnics, corporate functions, school events and more. Max. Participant Height: 6' 4"